The Developmental Program is by invitation only and is designed to provide an opportunity to young girls showing potential to become competitive in gymnastics. Girls are placed in the Developmental Program by coach recommendation or through an evaluation process. This group/program is for girls who show an above average ability and an extraordinary enthusiasm for the sport of gymnastics. Participation in the Developmental Program will allow development of greater strength, flexibility, and skills that may lead to future participation in gymnastics competitions. While skills are a big factor, the child’s desire to learn becomes an even bigger factor. This program gives us the chance to see how the girls respond to greater expectations of time, effort, good behavior, etc. 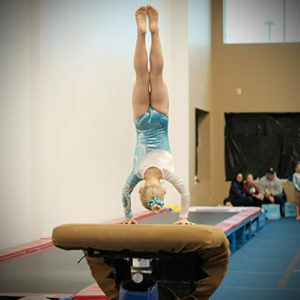 It is important that future gymnasts have the necessary basics to learn upper level skills safely and properly. This path is not right for all kids, and that is okay. The level of commitment required to participate in competitive gymnastics is greater than in recreational gymnastics. The time and financial commitment is one that may not be right for all families. Participation in the Developmental Program starts with a lower level of commitment. This allows parents and coaches to determine whether or not competitive gymnastics is a good fit prior to making a more serious commitment. Participation in the Developmental Program is by no means an automatic path or right to the HOPE Gymnastics Competitive Program. After every season, the girls are re-evaluated and then recommended to the appropriate program that best suits their abilities. This program also provides a base for strength, coordination, balance, flexibility, and discipline that will benefit these young athletes in other sports and activities now and in the future. This program will focus heavily on proper technique in very basic skills, building strength and flexibility in the early years when it the easiest to accomplish, and foster discipline which is crucial to upper level gymnastics. This program trains twice a week for 1.5 hours (total 3 hours/week). The selected are chosen for their listening skills, ambition and potential. They will be introduced to all events (vault, bars, beam, floor) along with trampoline and fast track being important learning tools. They will also be introduced to stretching, conditioning, and learn the importance of focus while ensuring an ideal balance between Fun, Fitness and Fundamentals. This program will train twice a week for 2 hours ( total 4 hours/week) The focus is on continued increase in strength and flexibility while becoming familiar with dance and gymnastic skills to prepare these gymnasts for competition. This program will train 3 days a week for 2 hours (total 6 hours/week. The group will be working closely with the JO Program to further their conditioning, drill and skill development. Here they will also learn about self-discipline, hard work ethic, social skills and teamwork.